The Department of Archaeology has begun archaeological activities in the Eastern Province to preserve and rehabilitate cultural and sacred sites of historic importance. 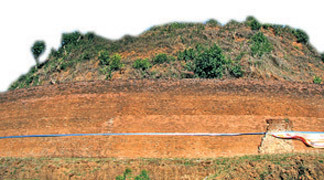 Archaeology Department Director Nimal Perera said archaeologists have started rehabilitation and excavation projects at Neelagiri Maha Seya and Deegawapiya archaeological sites in the Lahugala forest reserve. “The development of these sites for the restoration of historic stupas and other religious structures in them, has remained at a standstill for at least 25 years due to terrorist activities in these areas,” he said. Deegawapiya is said to be a site where the Buddha had set foot and meditated. The Deegawapiya Dagoba dates back to the third century BC. It was built by King Kavantissa’s younger son, Prince Saddhatissa. Perera said the excavation project of Deegawapiya can reveal interesting ruins of archaeological importance. According to Archaeology Department’s Museum and Maintenance Deputy Director M Madagammana, excavation of the maluwa area of Deegawapiya Dagoba where the sacred relics of the Buddha are kept, has been completed. “We have started work to uncover the structure of the Dagoba,” he said. Madagammana designed the Deegawapiya and Neelagiri Seya excavation projects. He said Neelagiri Seya is the largest stupa in the Eastern Province. “We are trying to bring to form the shape of the Neelagiri stupa,” he added. The government funds the two excavation projects. Bank of Ceylon has extended financial assistance for Deegawapiya excavations, he said.